If you have a need for a basic garage, there are plenty of designs to choose from. 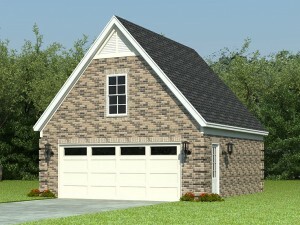 The Garage Plan Shop offers everything from simple 1-car garages to 4-car garage plans and even larger designs. But wouldn’t it be better if there were a bonus? Have you considered a garage loft plan? Garage plans with lofts are fairly common especially in the one-car, two-car, and three-car styles. If you are going to take the time to build a garage, you might want to consider other needs you can satisfy by incorporating a loft. Detached garage loft plans accommodate a broad range of needs and come in a generous selection of sizes and architectural styles allowing you to find one to blend perfectly with your home and satisfy your needs. The loft space is an unfinished space located above the parking area and is accessed by a pull-down stair or an enclosed staircase. Some loft areas are strictly designed for storage having low overhead clearance but provide plenty of room to stash boxes and store other family treasures. This type of garage with loft is great for attic or basement overflow, seasonal storage and holiday decorations. Face it. Most families have a lot of “stuff” cluttering their living areas and other storage spaces. So consider reducing your clutter and organizing your belongings with the help of a garage loft plan. When a garage offers a loft space that is large enough to move around freely and has a standard or slightly lower than standard ceiling height, the loft opens up many other possibilities that go far beyond unfinished storage space. Think about what special living space you’d love to have if you had the opportunity to add it to your home. Would you like a home office that is part of your home but outside the main house? Do you want a place to work in peace without ever leaving home? Would your family enjoy a recreation or game room? Do you enjoy crafts? Could you use a hobby or craft room? How about an exercise area to help you like a healthy lifestyle? The possibilities are endless when it comes to finishing the loft space of a detached garage. Talk with your builder about the numerous ways you can finish this space to accommodate your family’s specific needs. If you are planning to build a detached garage plan in the near future, consider the advantages of building a garage loft plan. Your family will surely reap the benefits for many years to come.